Thanks to itsjustanalias for this great photo. Over two million visitors come to Argentina every year to take part in cultural rituals like eating a delicious steak, dancing tango after midnight or going to a fútbol match between the rival teams River Plate and Boca Juniors. Most visitors soon discover that the fabric of Argentine culture is much more complex. It is a culture influenced by the variable, vastness of the country and its strong European ties and influences. From 1860 to 1930, Argentina experienced a wave of European immigration due to wars on the continent and an open door policy that encouraged European emigration. The majority of the newcomers came from Spain and Italy but English, German, Welsh, Ukrainian, and Jewish immigrants also formed sizable minorities. As the population grew so did the country’s exports, including beef, wool and agricultural products. The industriousness of the newcomers and the country’s exports made Argentina the 10th richest country in the world in 1913. This time period, the early 20th century, has shaped the country’s consciousness and continues to fuel nostalgia for a golden past. Thanks to its European patrimony, Argentina enjoys a rich Italian cuisine, French, Spanish and Italian architecture, and a passion for conversation and café culture. The national language might be Spanish, known here as castellano, but it is a Spanish spoken with an accent unlike any other country in the Spanish speaking world, with Italian inflections and influences from other languages. Family, friends and socializing in general are the essential parts of the country’s national lifestyle, from fútbol to food. It is often noted that Saturday is a day for friends and Sunday is reserved for spending time with the family. On Sundays, the neighborhood parks are full of families having picnics with every generation present. The day never ends after work, it seems sometimes the day is just getting started at 6 pm.The asado, the emblematic Argentine barbecue, has long been an excuse for family and friends to get together and enjoy Argentina’s fantastic meat products-or anything else that can be grilled for that matter. 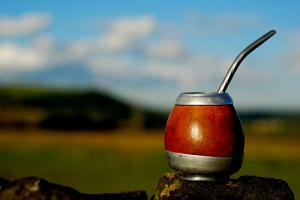 Similarly, mate, Argentina’s warm caffeinated beverage of choice, is traditionally consumed in a group setting in which a shared gourd is passed around in turns until the yerba mate, or tea leaves, has been exhausted. Even the tango, which has played an important role in Buenos Aires’ history and continues to be symbolic of the city’s culture, is a social dance, traditionally enjoyed at events called milongas. The macho nature of the tango reflects Argentina’s Spanish roots though the origins of tango are to be found in the poor, polyglot immigrant neighborhoods of late 19th century Buenos Aires. Machismo is much less prevalent in Argentine society than it once was, as women today have experienced a great deal of social progression and equal opportunity both in the workplace and at home. Female political representation is particularly noteworthy, as Argentina ranks fourth in the world in terms of highest proportion of female representation in national legislatures (40%) as well as having recently elected a woman president, Cristina Fernández de Kirchner (for more on the political nature of Argentina, please see Politics). As in its diversity of geography that spans from jungle in the north to glaciers in the south, Argentina’s different regions also have differences in culture. In the north, the pace of the day is slowed by siesta and the countryside is pastoral compared to the busy metropolis of Buenos Aires to the southeast. Regional differentiation is true not only for siesta, but for many other elements of Argentine culture. Distinct topographic and social realities have shaped the unique cultures that have developed in respective regions, such as the gaucho culture of the cowboys who have historically herded cattle in the Pampas region in the interior of the country. While Buenos Aires is often viewed as the heart of Argentine culture, dictating what occurs in other parts of the country, the nationally symbolic gaucho culture is just one example that this view is too limited. Other examples include the fact that the popularity of folkloríca, or Argentine folk music, surpasses that of tango in rural areas and that Patagonia is better known for its lamb than its lomo. Nevertheless, Buenos Aires and its proud inhabitants, called porteños, certainly should be credited for creating an exceptionally dynamic, cultured and exciting city that deserves its accolades. Both internationally and domestically, all eyes tend to be on Buenos Aires as it indubitably functions as the political, financial, academic and artistic center of Argentina. As Argentina’s port, nearly everything entering the country goes through Buenos Aires. The “Paris of South America” is likely to serve as your port of entry as well. A rich and eclectic culture awaits you here, both within the city borders and beyond. This page rendered in 0.994 seconds.